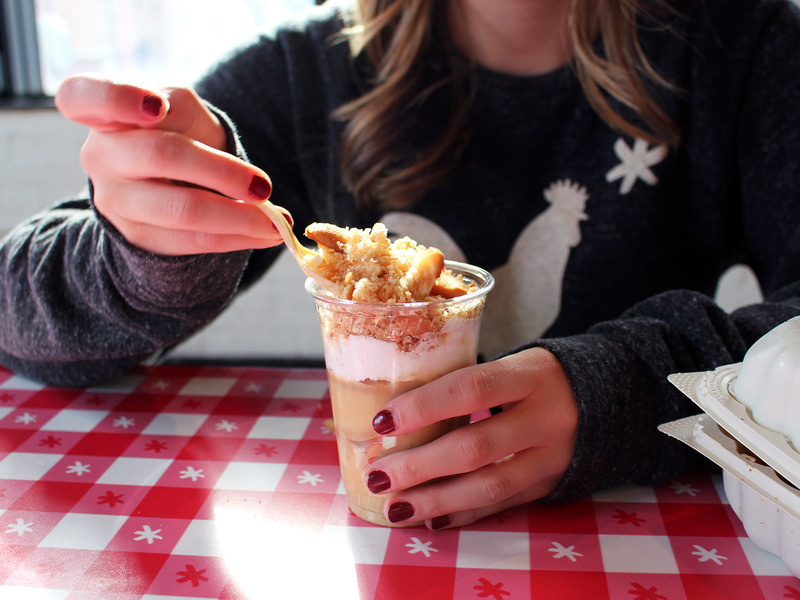 The version served up at Hot Chicken Takeover in Columbus, Ohio puts a lot of other banana puddings to shame, and here's why. Hot chicken is everywhere these days, and just like those other classic foodstuffs that have been upscaled, reinvented, and sent around the world (ramen, doughnuts, pizza, ice cream), the many fresh-faced facsimiles of the original are not always essential eating. Fried chicken is easily gotten wrong, hot chicken easier still. Anyone lucky enough to possess even a passing familiarity with the nitty-gritty Nashville original can tell you this. It is with a measure of skepticism, then, that I walk into Hot Chicken Takeover, a smash hit pop-up that begat a location above a thriving public market that begat a gleaming, brick and mortar location, all in Columbus, Ohio. It didn't help, either, that I'd just swanned in from Nashville, five hours' drive to the south, still practically flush with capsaicin. However, possessing some prior knowledge of my destination, I wasn't entirely concerned with the outcome of the eating bit—besides being an immensely popular restaurant, Hot Chicken Takeover has achieved no small measure of renown for its enlightened employment practices in a city that it is itself already fairly progressive. If nothing else, it would be nice to experience a restaurant that has worked so hard not only at being a great place to eat, but also a great place for people to work. Here's the thing—the food was very good. Great, even. Scrubbed down and cleaned up, okay, but then again, people really like Nashville's own Hattie B's, and this was no less spruced up than one of the restaurants in their expanding empire; I couldn't fault Columbus for really enjoying the no-mess-required, boneless breast sandwiches that they sell a lot of here, or the fact that the hottest chicken they offer here (ask for "Holy," as in, "Holy %@$!") would probably not quite do the trick for an old-timer Nashvillian, but like I said, it was very good. The real shocker, however, came at the end. There's only one dessert served here, which is Miss B's Banana Pudding. It sells for $3.50, and it comes in a little plastic cup, looking like an exciting parfait, and with all apologies to every restaurant in the South that has pushed me into eating vats of banana pudding because theirs is the best (isn't it always), the banana pudding at this chicken restaurant in central Ohio, while being made of the same essential ingredients, wasn't just miles better, try light years. Try from a galaxy, far, far away. I didn't want to leave town without the recipe, and while the restaurant was quite guarded about the exact details, I did learn a few things. There is, for example, a Miss B, who has a full name but doesn't like anybody knowing it; Miss B was a staffer at Hot Chicken Takeover in its earliest, formative years, and kindly shared her family's tightly-held banana pudding recipe. Originally, the stuff was sold in 16 oz. cups, and while the pudding, like the rest of the menu, was an instant success, the staff couldn't help but notice that for most customers, this was way too much to eat in one sitting. These days, you get about half that, but at that bargain price of $3.50. The cool, sweet (but never over-sugared) dessert is the perfect follow-up to all that crunch and spice, and even if you don't like fried chicken, next time you're in Columbus, stop by and grab some of pudding. Or, just stay home and make it yourself—here are a few tips, edited from advice passed along by the restaurant, that ought to help you get quite close to the ideal. Use fresh bananas—the closer to overripe, the better, because you're depending on them for your flavor. Also, you're not slicing them and dropping them into pudding raw, like some places do—you're cooking them. Not that it should have to be mentioned, but just in case: no leaning on your stash of banana extract allowed. Make a proper pudding. There's no way this is going to work with anything out of a can or a mix. If you don't have a favorite recipe, here are a few to get you going. Always toast your wafers (Nilla, or otherwise) with real butter and a pinch of sea salt before crumbling and placing on top of the chilled puddings, keeping this essential component nice and crisp for contrast. Accept no substitute for real whipped cream.